This is something that the lovely Toushka has been doing over at her blog, Ramblings from Toushka, and I though I'd join in this week. This photo was taken in January 2006, at about 3 in the morning in Stockton, just outside of Newcastle. Dave's grandparents lived at Stockton, and every year since he was young they went up there in January for a week. From 2004 I became a part of that tradition. 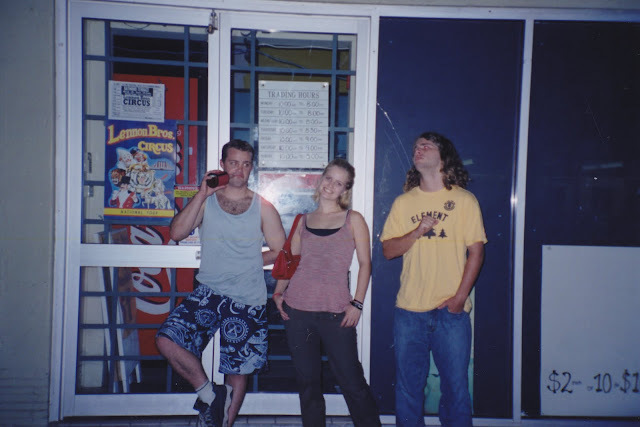 This particular night the three of us had gone to the bowling club across the road from Nana's (E & J were staying there, Dave, D and myself were staying at the Backpacker's) for dinner (N & D came too but they went home after dinner) and then after closing, we sat on the beach for hours just talking and hanging out. It was the first time I'd spent a really long period of time talking to my future bro & sister-in-law and we were definitely closer after that night! It's amazing the things people will tell you when they've been drinking. And being the only sober one, I remember it all! I'll always remember that night as the night I really got to know E & J and started to really feel like their 'sister'. P.S. Thanks Toushka for some great blogging inspriation! sounds like some good memories there. Thanks so much for playing along.